Patches fix many bugs and/or implement balance tweaks. They are sometimes released alongside a new, major DLC; when this occurs a portion of the DLC's features are usually shipped as part of the coinciding free patch, thus made available to anyone who has the base game. Hotfixes are very small updates to the game that usually fix only a few bugs and may contain a few changes to the gameplay as well. Hotfixes are commonly released shortly after major patches to fix any unforeseen bugs that came with the previous update, or independently to fix newly-discovered bugs or exploits. Note that newer DLCs cannot be activated if you're playing on an older patch version. E.g. You cannot activate Conclave if you're playing 2.4.X and older, and you cannot activate Conclave and Horse Lords if you're playing 2.3.X and older. This is more applicable for mods, who have various levels of compatibility with new patches. 3.0 2018-11-13 PXTU Released alongside Holy Fury. 2.8.3.3 2018-09-07 SAHQ Hotfix. Note: Beta patch 2.8.3.4 can be reverted to via Steam Beta branch and has same checksum. 2.8 2017-11-16 PLQA Released alongside Jade Dragon. 2.7 2017-03-07 WHGQ Released alongside Monks and Mystics. 2.6.3 2016-11-24 VNFM Update for the EU4 converter for EU4 patch 1.19. Released alongside The Reaper's Due. Note: patch 2.6 was never publicly released. Note: patch 2.5 was never publicly released. 2.4.5 2015-10-16 NFUF Patch. Can be reverted to via Steam Beta branch. 2.4.2 2015-07-21 AJJW Patch. Was initially an open beta patch. Note: patch 2.4 was never publicly released. 2.3.6 2015-06-11 JWMQ Hotfix. Can be reverted to via Steam Beta branch. 2.3 2014-12-16 BTOF Released alongside Way of Life. 2.2.1 2014-11-18 DPOO Patch. Can be reverted to via Steam Beta branch. 2.2 2014-10-14 URWO Released alongside Charlemagne. 2.1.6 2014-07-02 TTXL Hotfix. Can be reverted to via Steam Beta branch. 2.1.1 2014-03-25 CFYM Released alongside Rajas of India. 2.0.4 2014-01-17 FCUV Hotfix. Can be reverted to via Steam Beta branch. 2.0.3 2013-12-20 COWM Hotfix. First steam-exclusive patch. 2.0 2013-11-18 WGPN Released alongside Sons of Abraham. 1.111 2013-08-16 MLYP Hotfix. Can be reverted to via Steam Beta branch. Each patch has an associated checksum that allows to verify the installation is correct. On the CK2 launcher: it is the reference/expected checksum (hardcoded). On the game lobby, in the bottom left: it is the actual checksum, dynamically calculated from the loaded game files. Older stable versions are available through Steam Beta tab. It gives "people a chance to finish of saves already started! (in case a patch breaks save files, or game mechanics changed too much for your liking)"
In the launcher, unselect any DLC released after the selected patch, otherwise the game will crash. If the version you are rolling back to is from before the GDPR changes took effect you will need to get a code Paradoxplaza. Click Show below Your Games. 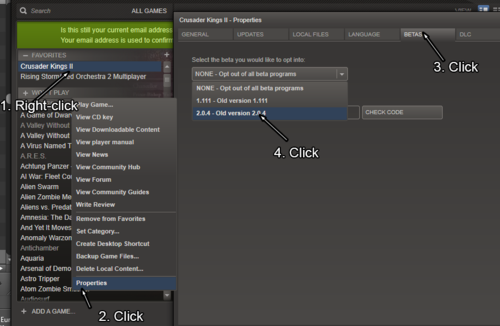 Copy the code for CK2, and paste it below the drop down menu in the BETAS tab. The process is the same, to go back to current version, by selection NONE in the dropdown instead. ↑ How to rollback your version of CK2 to a previous one! This page was last edited on 18 April 2019, at 18:20.